Have you replaced the batteries in your Prius yet? If so, how much did they run and what voltage is the pack configured for? I've never seen nor heard of one having to be relaced, one reason I believe is on the NIMH packs anyway the car won't charge above about 80% SOC, nor discharge below 40% SOC. Just like all automobiles many Prii's get totaled. Battery packs are available for very little money in junk yards, some people make thir own plug in hybrids using additional packs from junkyards. I beleive the pack voltage is around 300V ? Higher voltage will carry more current through smaller wires of course, if there were to be a Hybrid boat,I can't imagine it would have a giant 12V battery bank, that would be inefficient. A Prius does have a very large inverter, large enough that it has it's own cooling system, but what it converts to I do not know. Are you saying use a diesel to run a hydraulic system to run the propeller? If so that would be like running a really inefficient transmission. Great for a 4x4 tractor with a front end loader that only goes 15 mph on land. The issue with hydraulics is the faster you get the fluid moving the higher the Reynolds number (Turbulent Flow) therefore heat/energy loss. Plus hydraulic leaks are a pain. Yes that's what I'm saying. But a boat doesn't need to go fast either. Also, it allows you to put the engine/generator anywhere you want really. The same engine generates charging. No transmission to fail either! Although I've had pretty good luck with marine transmissions, a lot of people on this forum evidently haven't. But yeah... hydraulics do cause a lot of heat and cooling is needed. However, I was thinking that running a boat prop at a fairly steady rpm might not be too bad. Yeah... leaks are not hydraulic's strong suit. The maintenance guy who used to work for me had a saying "If it aint leaking it aint hydraulic"! Replacement packs appear to be $1200-1700 aftermarket and more from Toyota. "And you also should know that the battery packs are available from any Toyota dealer. The MSRP for a battery pack for a first-generation Prius is $2,299, while the MSRP for the battery pack for the second-generation cars, those from the 2004-2008 model-years, is $2,588." I've thought about buying a hybrid before, but been unsure of the real $ savings as the battery pack life seems unknown. If a pack costs $2500 and lasts 8 years that's $312 a year cost. Depending on how many miles you drive it may mean you should just buy a cheap 35-40 mpg Hyundai and save maybe $8-10k up front! if there were to be a Hybrid boat,I can't imagine it would have a giant 12V battery bank, that would be inefficient. The Torqeedo inboard motors are 48v. Probably the same for Oceanvolt. Steyr and ReGen Nautic both make serial systems. I like the idea, but question the cost/efficiencies. I have heard bad things about the Steyr engine/generator but I can't remember where. Maybe some of the other forum members can elaborate. Likewise, mostly related to HCU and remote control electronics, and their suitability for the marine environment. More just a post that there are a number of viable vendors in the marine marketplace with varying types of hybrid diesel solutions. But since we don't all know their names like Volvo, Yanmar, Beta, etc. they clearly are not yet widely adopted. I suspect that's because for long period, steady propulsion a direct drive diesel is hard to beat. 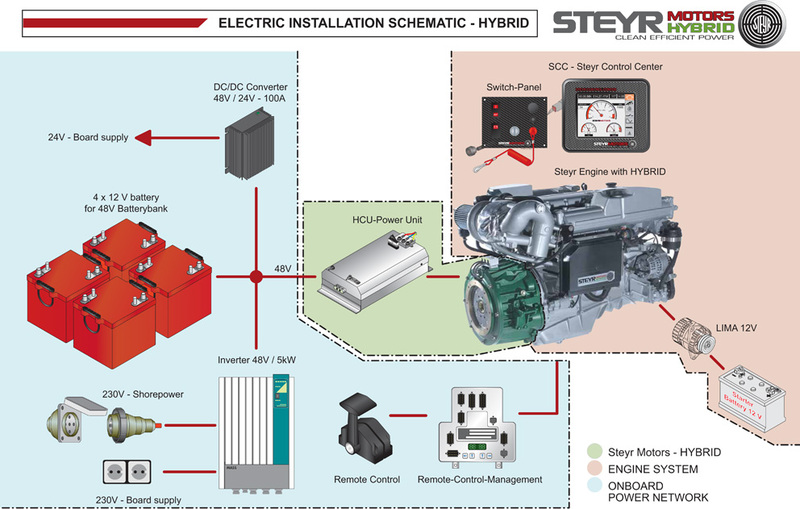 And cost-wise (and maintenance complication wise) hybrids currently seem to be more than having an auxiliary and separate diesel generator. I like the potential elegance of one engine for all power production, and the potential to motor (whole new meaning to that term) in and out of the marina on the batteries, but both of those are still potential from what I can see. I read pretty avidly the posts from the members here with electric drive, and I appreciate their bleeding edge work in getting real-world data and usage information. Diesel is more efficient than diesel electric. Diesel electric does not make sense for long range constant speed use. The diesel will have been chose and set up on a fixed shaft and propellor to work the diesel at its optimimum specific fuel consumption. Diesel electric is used in cruise ships for convenience in manouevering. It allows the use of pod drives and avoids the need to pay for tugs when docking. They also dock very often. All big long distance container ships use a single big diesel on a single fixed shaft and propellor for optimimum efficiency. They also use heat recovery and steam turbines to get more out of the fuel and can compete with the best oil fired land based power stations in the efficiency stakes. Diesel electric makes little sense in a boat when you start looking at the specific fuel consumption maps of a modern, common rail, direct injection, electronically controlled, turbo charged, diesel engine. Note the last question which went unanswered. A straightforward fixed propellor shaft installation on a modern 6 liter John Deere is always at least as efficient as the diesel part alone in the hybrid installation - not accounting for any electrical losses. In four years, thats $21,000 I saved in fuel, and 7,000 gls of more gas for everybody else to say nothing of the lower pollution etc. But yes unless you drive a LOT, you do not save money with a Hybrid. A Hybrid for a working slob who drives a lot, makes sense. But a boat Hybrid will never save you money, it's not going to be more efficient, or at least I don't think so, it's advantages will have to be other things, ecenomy isn't one of them. I just bought an Autoprop, tremendously expensive thing. Will supposedly increase part throttle efficiency lots, burn less fuel, increase range, make motorsailing much nicer. Taht's if it lives up to the Hype anyway. I am sure it will never save enough in fuel to pay for itself, but if it does the other things it's supposed to, I'll be happy. I think a Hybrid boat will be similar, if you want to eb able to run your AC all night without a generator, then you will like it, but I think you could accomplish most of the adavntages of a Hybrid with a monster LIFE battery bank and gobs of Solar and a big generator. I have both 'rebuilt' prius battery packs and replaced them. They are $1800 these days, 6.5ah cells. They are not useful for anything but a prius. You can buy lithium battery packs for less, and they are half the weight. I've owned 6-7 of them, have 2 right now, and getting 3rd to replace the transaxle this weekend. Most mechanics are afraid of them. As a64 points out, they get great mpg on the highway because the engine is tuned and optimized to run at 1500-2500. In fact, on the highway the engine still spins the generator that powers the electric motor without using the battery for most of the highway power. I've pointed out with links previously the prius gets better MPG than the equivalent diesel car in real world data. It is certainly more complex than an all-electric car, but not that much more than a gas car, compared to an automatic transmssion car, the transmission is quite complex compared to the prius transmission with the two motors, but because the automatic transmssion has been around for decades, nobody considers it complex, and btw, they are the usual failure in a car (the auto trans) if the engine doesn't overheat sometime before that. Anyways, the point is if you tune a gas engine to run as a generator it will be more efficient than if it has to operate at low and high rpm as well. Diesels are kind of that already, as they don't work at all at high rpm, and poorly at low rpm also. As I posted previously, converting a boat to electric is not difficult or even expensive. As always, it is the batteries expense really, but for a sailboat, you don't need a lot of them. The problem is the market is so small, the few people in business to do it have to charge high prices which limits the market, which means higher prices, blah blah. You can DIY it quite easily, many have done it. Search and ye shall find. Prius uses what they call a Power Split Device instead of a transmission, it is a planetary gear system with two inputs, the gears are never disengaged and nothing shifts, the speed ratio is varied by changing the speed of the two inputs. Engine is one input and a wheel motor / generator is the other. The engine also has a motor / generator on it's flywheel essentially, although it can charge the traction battery at highway speeds, it drives the wheels directly, but the battery can be used for passing, climbing hills etc, but it does not generate electricity to drive an electric motor for propulsion, it drives the wheels directy through the PSD. What does this have to do with boats? Well a boat could do the same thing, drive the prop either directly by the engine, or directly by an electric motor or both, it could also just charge batteries with a planetary gear system ALA Prius. FWIW, since the Prius gear train is always engaged and the motor does not run backward, there is no reverse in the usual manner, reverse is pure electric only. Average mechanic won't touch a Prius, they don't understand the things, they would only be a tiny fraction of their work and learning about them, having the special tools etc., just wouldn't make sense. I bet you would find the same thing with a Hybrid boat. Porsche years ago built and certified an excellent small aircraft motor, was a very good motor, one of the biggest reasons it failed was most mechancs refused to work on it, they wanted only to work on what they were familar with. 45 miles to the gallon. No major work needed on either. I have posted on this subject on a sister thread, so here are the results of some 2 years research into designing a power boat, 65', using diesel electric. I worked with Bill Crealock shortly before he passed away on the design and spent quite a few hours with some engineers from Siemens on the D-E design. There is not much new in D-E other than advances in battery capacity. Siemens has been building D-E systems for over 100 years. First you have to keep this basic principle in mind: It takes a specific amount of energy to move a given hull at a given speed. It matters not what the source of that energy is, solar, diesel direct propulsion, D-E or a bunch of guys with oars. Then you have to understand how the D-E system is set up in a boat. A generator produces electricity on demand, i.e. whenever the engine is running. However, the generator does not drive the electric motors directly, all it does is charge the batteries. All electrical systems on the boat, including the electric propulsion motors are run from the batteries, using an inverter for 120VAC. We looked at several different issues with some design goals in mind-fuel efficiency, space/weight/location considerations, simplifying the standard twin engine/twin generator system of an average 65' powerboat. Our results were somewhat surprising. First, there was no significant fuel advantage. The claim has always been that a diesel generator only charging batteries will run at a constant, most efficient, speed thus saving fuel over a propulsion diesel running at varying loads. In fact, the true fuel savings are negligible, around 3%. On machinery simplicity, in our case, the normal 65' will have twin diesel propulsion engines, a large, maybe 20KW, generator and small, maybe 8KW, generator. So, four diesel engines. Our design needed about 330-350 HP for propulsion, that converts to a 260KW generator. We could have a smaller generator, say 75KW, as a second power source. Thus, it was simpler, and lighter and required a bit less mechanical space. But, what about the batteries? As is always true, the biggest issue with electricity is how to store it. We had way more battery capacity than you would ever want to put on a sail boat, it would sink, the original design was for 24 batteries. Even then, the calculated run time on electric power alone was only about 60-75 minutes at 4 knots. Oddly enough, the one real, substantive advantage we did find was the ability to place the diesels anywhere in the engine room. That shortened the space needed on front of the shaft, i.e no engine there anymore. the Siemens motors we looked at were only about 18" long and were direct drive so no transmission. We needed about 25% less mechanical space. Our conclusion was that the cost of installing a D-E system far outweighed any potential advantages and provided no advantage in the operation or maintenance of the boat. In the naval vessels they had 4 generators - most of the time only 1 or 2 would be required to be run; if more power was needed, another genny was flashed. I don't see why it wouldn't be possible/feasible for recreational vessels to have two smaller generators and a combiner, to cover the gamut of power needs from normal cruising loads, to the ability to run flat out for extended periods. Exactly my thought. I would always have a (at least one) genset anyway. In a torquedo-like cat, I'd probably want one genset for max constant house loads (aircon and such) plus a little extra... and another genset to add into the chain when necessary for additional propulsion time. Additional advantages as to location -- for weight balancing and service access -- abound. Electric motors require much less maintenance, almost nothing compared to diesel and they burn no fuel. No disagreement with your main points, but I'd say electric motors DO use a "fuel" of sorts. Just not fossil. Otherwise, it'd be magic! We certainly couldn't use D-E in our current boat style, but I'd have thought many of the folks here would actually be using their sails for all that long range stuff.